Shame & vulnerability in the workplace, showed up for me as dysfunctional behavior, self-sabotaging behavior, self-loathing behavior’. 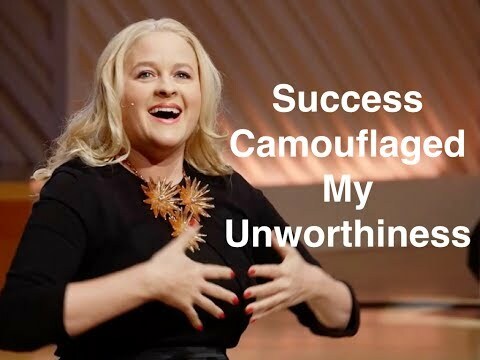 ‘Success camouflaged all of my unworthiness’. You see, we don’t get to separate out, our personal life, and our business life. Shame insidiously infects our self worth, our self esteem, our confidence, the choices that we make and it might start of small, like feeling like you don’t have a voice. Maybe you don’t speak up in the boardroom, maybe you don’t go for that promotion that you wanted, and then it starts to escalate. Shame is highly correlated with addiction, violence, aggression, depression, and bullying. I don’t know about you, but I’ve seen some of that show up in the workplace. You see, I knew that I had to get ready to speak my truth, but I didn’t know how. I’m not saying that you have to have a company-wide meeting, and discuss your secrets to the boardroom, but we have to figure out how we can at least share it with ourselves. How we can be vulnerable enough to at least be honest about what those fears are, and what’s driving us. For more talks on Shame, Vulnerability, Stigma and Fear check out KirstyTV the channel on youtube. Or watch Kirsty Spraggon’s TEDx talk. ‘You’re only as sick as your secrets’.